'Local Colours' Exhibition at Wan'din'in - Eumundi & District Historical Association Inc.
Local Colour - Exhibition by Carole Roberts, Meg Woods and Jenni Radke. October 17 to November 8 at the Wan'din'in arts space in Eumundi behind Discover Eumundi. The first of a series of exhibitions by local artists, who were successful in applying with expressions of interest to use the space. 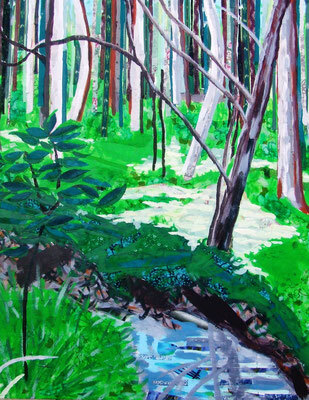 Carole Roberts' new work draws from the natural beauty and light of the sky, ocean and bush landscapes around her local area of Peregian Beach. She notes that the sky in this area has such a brightness that it appears to shimmer with a glowing white radiance. 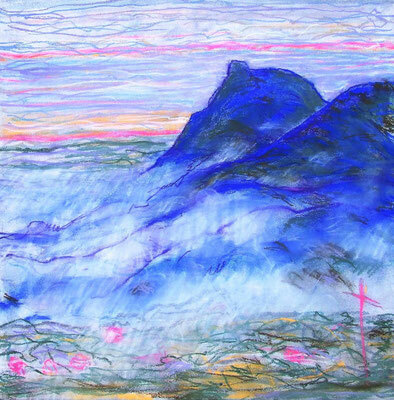 Many of her works are imbued with a spaciousness of light and emanate a peaceful calmness that seems to suggest a connection to something higher than ourselves. 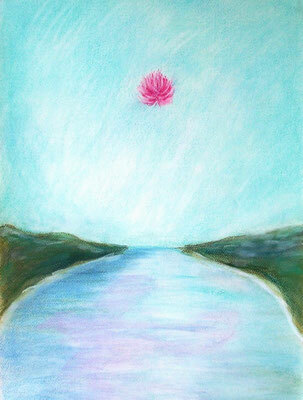 She also draws inspiration from her imagination and images that come during meditations. Her mixed media works are semi realist to abstract and utilise acrylic paints, fabric and glue. Fabric strips create the vertical lines of the forests and splashes of colour that appear through the tree trunks. With a view of Mt Ninderry from her studio, Meg Woods is fascinated by the influence of the changing light and weather on the aspect of the mountain. Mt Eerwah and Mt Cooroy make up a triangle of local volcanic mythical mountains. Woods has interpreted these influences in her energetic and colourful works, using mixed media, pastels and acrylics for her creative contribution to the Local Colour exhibition.